Your outdoor living space can be just as fun and relaxing as your indoor living space. Whether you’re starting over fresh or looking to update your current patio setting, a good place to start is with furniture. After you have chosen the furniture, you may be thinking that your patio needs a splash of color. Maybe you’re looking to decorate your patio with a certain theme? Now you’ve placed your furniture, as well as your tables and maybe even some plants. I bet your thinking that you’re still missing something. Have you put any thought into purchasing cushions for your furniture? Outdoor cushions can help give your patio or deck, that inviting feeling you’re looking for. Some people think that cushions are there solely for comfort, but that isn’t the only reason you should consider buying cushions for your outdoor furniture. Outdoor cushions not only provide a level of comfort, they can also serve as accent pieces. Making your outdoor space much warmer and inviting. There are now a plethora of choices when shopping for outdoor cushions, you really have to watch to be sure the cushions you are purchasing can hold up to the elements. This buying guide will show you what we consider to be ten of the best outdoor cushion options. We will also walk you through the information you need to know to ensure you’re truly purchasing cushions meant for the outdoors. The first cushion on our list gives your patio furniture a pop of color, while keeping you comfortable. With the variety of colors and patterns, there is sure to be one that catches your eye. These cushions are durable as they have added resistance to the elements. 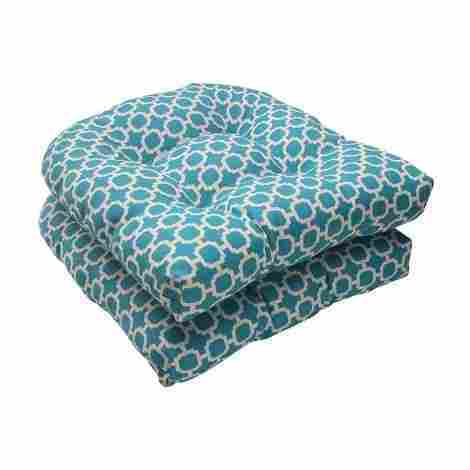 The outer shell for these cushions is known for being fade resistant, as well as water resistant. 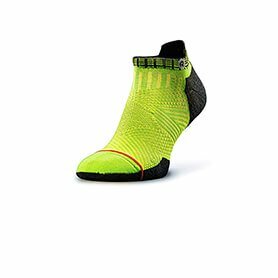 This is good news for the bright colors and patterns offered, as they will remain as sharp looking as the day you bought them. These cushions are filled just right, so you can assure that you and your guest can kick back to relax. The type of material used to fill these cushions won't hold water, so mold and mildew won't become a problem. Since these cushions come in a set of two when ordered, it makes them a great value for the price. You gain a set of cushions that can resist fading, while lasting in the area of comfort as well. This option is great for your patio love seat, as it is more of a bench style cushion. The design holds the filling in place, while the cushion has some security of its own. To hold the filling in place, this cushion design creates areas that help to hold the filling where it should be. You never have to worry about that uneven cushion look or feel. The filling has a sense of security, as does the cushion itself. This cushion comes complete with ties, so you can secure the cushion in place. No more sliding cushions, or picking them up after a windy day. This cushion has some great benefits, in the area of functionality. Not only do you get to choose from some great color options, you also get a cushion that serves a purpose. This is a great cushion option when looking to replace your cushions for chairs with a larger backing. Filled to perfection, with plenty of beneficial properties to defend against mother nature. These cushions are filled to just the right level, that you remain comfortable time and time again. With just enough filling to prevent that dreaded flattening that happens all to often with cushions. Perfect for all your chair cushion needs, as these come as a set with the seat and the rest for your back. As a second great aspect, the cover for the backrest can be removed for a quick machine wash cycle. For a little more out of your pocket, you get a quality designed cushion. Great for use even with those DIY patio furniture designs, which allows you to explore your creative side. There are those times when you're not looking for a thick and overstuffed cushion. That is where a cushion like this comes in handy, as it will be slightly thinner than some of the others. 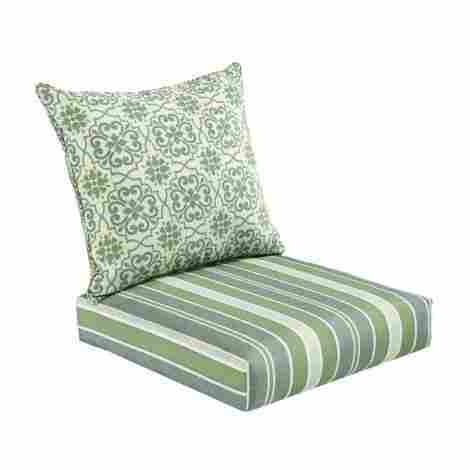 This is the perfect cushion for that bench seat you might have on your deck or patio. No matter where you live this cushion offers protection against all the elements. 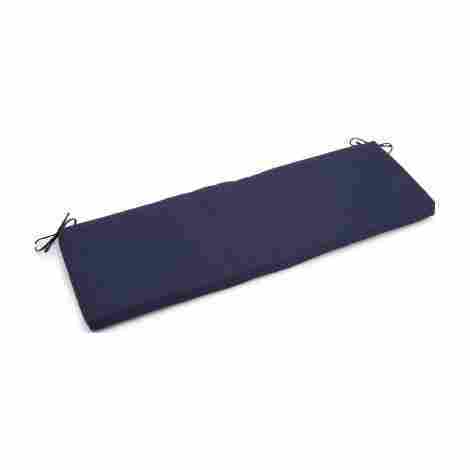 This cushion has an outer shell that zips closed, great for you as it can be opened and removed. Wash this cover as needed to keep your deck looking great all year round. This cushion can potentially withstand rain and sun, which means it will always look it's best. It is easy to care for design, so keeping that fresh look shouldn't be a problem. Another great option for your patio furniture needs, this cushion offers you some of the top qualities you are seeking. Rain or shine these cushions will withstand the test of time. Waterproof materials protect the cushion against moisture, which means no rushing out the door to pick up the cushions when the rain starts to fall. The best part of waterproof cushions is the fact that they are also resistant to both mold and mildew. When your cushions appear to be dirty, simply find a bucket and fill it with warm water. From there add a small amount of mild detergent, grab a rag and wipe the cushions down. Just like that, you have fresh looking cushions again. 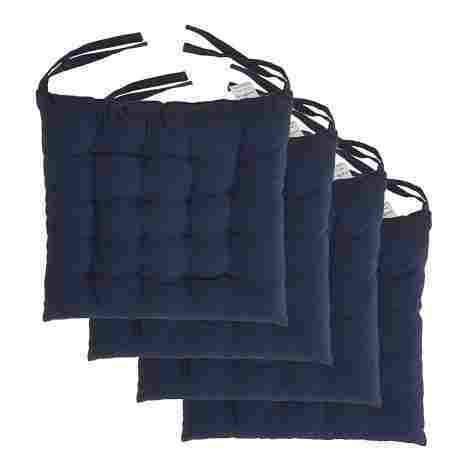 These cushions are built to last, so you know that the expense off hand, will be an investment that will prove itself. Resistant to mold and mildew, due to the waterproof materials used on the cushions. To keep them looking great, simply wipe them down with a damp rag really no fuss at all. This cushion would be perfect for your garden bench seating, or even your swing on the back patio. 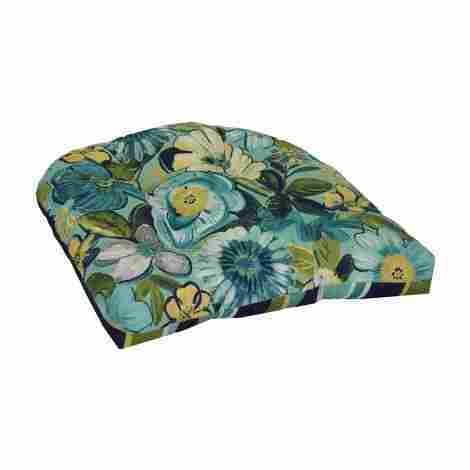 With the thickness of the foam in this cushion you are sure to be comfortable no matter where you put this cushion. As one of the thickest options on our list so far, this cushion has a three-inch thick layer of foam. Keeping you comfortable on your garden bench or while swinging in your backyard. To keep that clean appearance, this cushion can be removed from the outer shell since it has a zipper closure. Once you have removed the outer shell of the cushion, all that you have to do is toss it in the wash.
Quality materials and construction are bound to cost you a little more than average for cost. Sure this cushion comes at a higher cost, but you're getting a thicker cushion with an easy to care for cover. A cushion like this one will work perfectly for the rocking chair on your front porch. It comes in a wide variety of size options, making it suitable for all different types of chairs. This type of fabric offers the most resistance to all the elements, which means it won't fade. It also means that there is no need to worry about that nasty mold that can sometimes grow in your cushions. With the vast array of size options, you can fit this cushion to almost any seat for any chair. this can help eliminate some of the time spent searching for that perfect size match. In order to get a good quality product, the manufacturer has to spend a little mare to make the product. There fore it stands to reason that you would also have to pay slightly more. But when your product last longer than some of the other options, does that extra cost really mean all that much to you? When you're looking to upgrade your entire patio, why not look into a set of cushions like this one. Made to withstand even the crumbiest of conditions, and still come out looking great. The fabric choice for this set of cushions is known for having a good amount of fade resistance. Pair with that resistance to water and mold, and you have yourself one mighty fine set of cushions. Not only do you get three cushions, they are sized so that you can redo your entire space all at once. This will ensure that you for sure will have matching colors for your cushions. This is one of the better deals as far as the cushions on this list go. You get three different cushions, making it easy for you to redo your entire space all in one purchase. This cushion provides you with the options to leave them out or take them in when you're finished. This type of cushion doesn't attach to your chair, so you can feel free to move them as you see fit. The material chosen for the outer shell of these cushions, provide the cushion with plenty of resistance to the weather conditions. Making it last for plenty of years to come. This type of cushion is smaller in size, it doesn't have ties so you can take these indoors for storage when finished with them. Doing this will help to prolong the life of the cushions as well. A good investment can be expected to cost a little extra money, such is the case with these cushions as well. You get a cushion that can withstand what the weather has in store. The last cushion on the list has benefits of its own, from the filling to the covering, this cushion has plenty to share. Available in multiple sizing options, means that you can order these to suit your needs. The way in which these cushions are filled helps to reduce the issue of flattening. It also tends to do away with those annoying lumps that can form inside of your cushions. This set of cushions comes in different size options and is sold in a set of four. Which is great for those who have more than one chair to add a cushion too, or for those who might be looking to have extra cushions on hand. 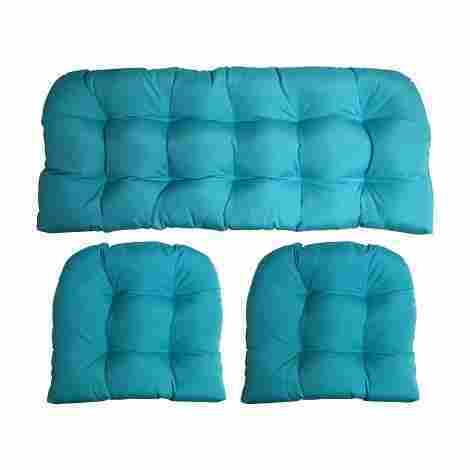 For a relatively good price, you get a set of four cushions, that are of good quality. They can be tied to prevent them from slipping off the chair, which also means you won't have to worry about the wind carrying them off. Upon finishing the information listed in this guide, you should be well informed for making the correct decisions in choosing your outdoor cushions. The design theme or color is a decision that you will have to come to on your own. There are multiple choices for outdoor cushions available, with those cushions come a multitude of price ranges. Keep in mind, the more you spend on the cushions, the better they will be. But not everyone has the type of budget that will allow them to spend a fortune on something that might only get used every now and again. Knowing what you want to spend on the outdoor cushions can help narrow the playing field. Put some thought into how much time you will have to maintain the care of the cushions. If you have an already crazy schedule, you’re not going to want to pick a cushion material that requires more maintenance. Eliminating some of your options due to the amount of care involved will also weed out a few of your choices. Take into consideration the weather conditions in the area that you reside. Yes, outdoor cushions are intended to be used outside. However, different material types will withstand different types of conditions. For example, if you live in an area that gets more sun exposure, you may not need a cushion with waterproofing. In this instance, you might want to seek a cushion that will resist fading when prolonged exposure to the sun is involved. Consider where your cushions will be during the time period that your patio or deck isn’t in use. Maybe you live in an area where you can be out year round, then you are going to need a more durable cushion. In the event you store your cushions for a period of time, you may not need cushions quite as durable. There are some people who prefer to change the appearance of their outdoor space from year to year. If this fits the bill for you, then you probably won’t be in the market for cushions that have a longer lifespan. Now those who use their cushions right to the bitter end, need them to have the longest lifespan possible. There are several different fabric options when considering your outdoor cushion purchase. Each fabric will offer it’s own beneficial properties to the cushion. Some fabrics will help protect against the suns harmful rays, by offering fade resistance. While others will give your cushion waterproofing or at least resistance. These two qualities can help to prevent issues with molding. It is best to read what each fabric has to offer before choosing one to suit your needs. One of the less expensive choices, vinyl cushions can give your cushions resistance to moisture. This type of cushion is relatively easy to clean with just a damp rag. On the downside of things, vinyl covered cushions tend to get hot when sitting in the sun. They are not always the most comfortable to sit on, some think that they are quite stiff. It is recommended to cover the cushions during periods of non-use. 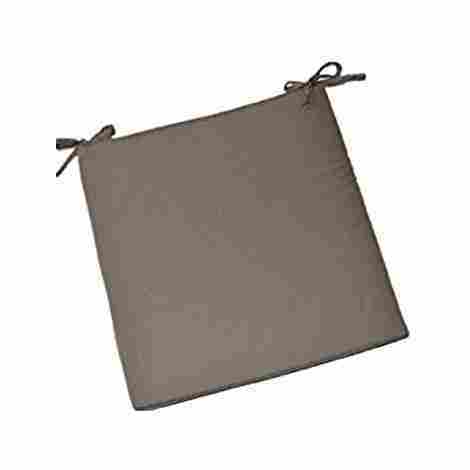 Cotton canvas isn’t costly at all, plus it comes in a wide variety of design and color options. This type of cushion provides a softer feel for the user but will need to be treated for water protection. If you prefer not to treat your cushions, you will need to make sure that you bring them inside when they are not in use. Be sure to store these cushions in a place that remains dry, when wet they will hold moisture for quite some time. This can result in molding and mildew problems further down the road. This fabric is made from polyester that is woven and then coated in PVC. Much like the vinyl fabric option, these can get hot when exposed to the sun. The polyester element to the fabric adds to the durability, by making them more resistant to tearing. Cushions covered by textilene are water resistant, but they are also known for fading over time. Sunbrella cushions are top of the class when it comes to outdoor cushions, but that does come with a higher price tag. This is the best option for those who intend to use the life out of their cushions, as they last the longest. Sunbrella fabric allows your cushions to be completely waterproof, resistant to fading, mold, and mildew. That’s a ton of potential in one cushion. This section will cover what is actually inside the fabric of the cushion, each material will provide a different level of both function and comfort. Before purchasing your cushion, decide if you’re going for looks or comfort. Cushions with polyester filling look great but are less functioning when it comes to comfort. What appears to be a soft and fluffy cushion, will flatten over time making it less comfortable to sit on. The only difference to this cushion filling and the polyester filling is the way the filling is treated. In a cushion filled with clustered polyfill, the polyester is formed into a bundle. This makes for a firmer felling cushion, but again these are prone to flattening. 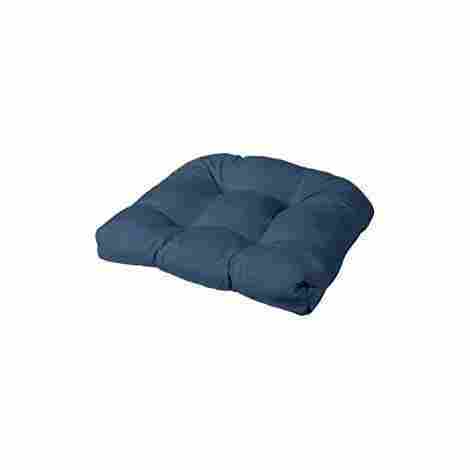 Cushions filled with foam offer a variety of comfort levels, this is due to the density of the foam. The best way to choose the right foam cushion is to test it whenever possible. This will ensure the cushion meets the comfort level you are searching for. Originally used for mattresses, Dacron provides the cushion with the firmness it needs to prevent flattening. Dacron also makes for the most visually pleasing cushion, as it provides a neat and tidy looking cushion. As an added comfort measure, these cushions will have a layer of softer material around the fill, giving them a softer more inviting feel. One thing to watch for when in the market for this type of filling is a cushion that states it is wrapped in Dacron. These cushions are drastically different, they have foam that is wrapped in Dacron, which will allow them to flatten. When it comes to cushions, you can find them in an array of colors, as well as patterns. Choosing the right one for your patio or deck furniture will be up to you. There are also cushions available that have what is called welting, which more or less is a way of outlining the cushion. This is thought to give the cushions a more sophisticated look, but really has no functional value to the cushion. 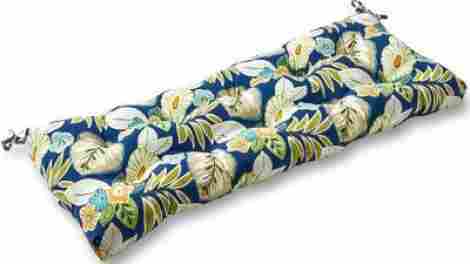 Some cushions will come with ties, these are great for securing your cushion to your furniture. If you get tired of picking your cushions up off the ground, then ties are the best option for you. It is always recommended that you refer to the care instructions from the manufacturer for cleaning your cushions. As some materials can’t come into contact with harsh cleaners like bleach. There are cushions that the cover can be removed, then machine washed. Follow the directions for washing set forth by the manufacturer. For those times when your cushions need a quick sprucing up, water with a small amount of dish soap will do the trick. After wiping down the cushions, be sure to allow ample time for the cushions to dry. This will eliminate the possibility that your cushions will mold. Q: Is there a difference between waterproof fabric and water resistant fabric? A: Yes there is a difference between the two types of fabrics. Basically, the water-resistant fabric will allow water to bead off the material for shorter periods of time. Eventually allowing water to seep into the cushion, causing damage like mold or mildew. Waterproof fabric fully protects the cushion against water, not allowing water into the cushion at any point and time. Q: I live in an area that gets a lot of sun, which fabric doesn’t fade as quickly? A: In this case, you would want to go with a cushion covered in Sunbrella. This type of fabric has the color completely mixed into the fabric, which gives the fabric amazing resistance to fading. These types of cushions are also known for their extended lifespan but do come at a higher cost than some of the other material options. Q: My cushions are always going flat, what type of filling should I look for that won’t go flat? A: There are a couple of options for you to choose from, the first is to look for a cushion with a denser weight foam. 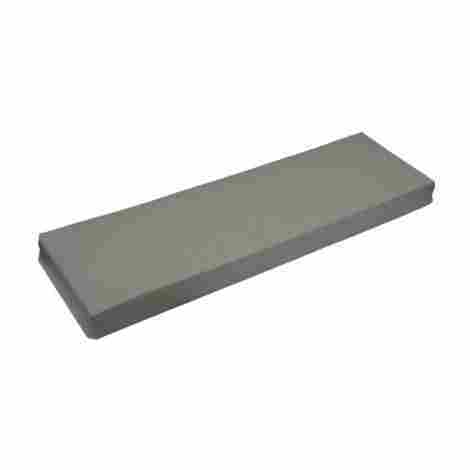 Typically cushions with a denser foam filling will withstand weight from use for longer periods of time. Your other option is to look for cushions that are filled with Dacron. Dacron is the filling used in some of the better quality mattresses that you see on the market. Make sure that the cushion doesn’t say Dacron wrapped, as these have more foam than Dacron in them.